Information on all births, deaths and marriages are required by state law. All physicians, hospitals, ministers, notary public and others must fill out and file the appropriate certificates promptly with the Town Clerk. The person named on the record. The person’s spouse or registered domestic partner. The parent(s) named on the record. Genealogists who have a researcher card issued by the Maine Center for Disease Control and Prevention, Data, Research and Vital Statistics. Individuals requesting copies of these records must present positive identification and, if requesting the record of a parent or grandparent and are not a registered genealogist, proof of direct lineage. Registered genealogists may only obtain a non-certified copy of a birth record, unless they can meet the above requirements for obtaining a certified copy. Birth records over 75 years old are considered public records and informational copies can be issued to anyone requesting them. The Maine Office of Vital Records does not permit or allow any records, whether certified or non-certified, to be faxed to any individual, business, or institution. If a person needs a certified record faxed to the airport for travel, that person must contact the Office of Vital Records in Augusta, Maine. Municipal Clerks may not fax certified or non-certified copies of birth certificates unless the Office of Vital Records has given authorization to the Clerk. Death records are available at the Frankfort Town Office assuming the death occurred in Frankfort; at the Town Office where the decedent lived at the time of death; and in Augusta at the Office of Vital Records. Individuals requesting copies of these records must present positive identification. If requesting the record of a parent or grandparent, and you are not a registered genealogist, you must provide proof of direct lineage. Registered genealogists may only obtain a non-certified copy of a record, unless they can meet the above requirements for obtaining a certified copy. They may only view or obtain a copy of a death record. Death records 25 years or older and fetal deaths 50 years or older are considered public records and informational copies can be issued to anyone requesting them. The fee for obtaining a certified copy of a death certificate is $15.00 for the first copy of the record, and $6.00 for each additional copy of the same record purchased at the same time. Certified copies may be obtained at the Town Clerks’ Office during regular business hours. In order to obtain a death certificate through the mail, the applicant needs to fill out a vital records search application and enclose a copy of proper identification and proof of lineage, if applicable. The application, along with the fee and a self-addressed, stamped envelope should be mailed to the Town Clerk at PO Box 218, Frankfort, ME 04438. Where do I obtain a Marriage License? If the bride and groom are residents of the same town, a marriage license must be obtained in the town where they both live. After obtaining a marriage license, the bride and groom are free to marry anywhere within the State of Maine. If the bride resides in one town, and the groom resides in another, a marriage license may be obtained from either town, but not both. Choose the town that will be the most convenient for you to obtain a certified copy of the marriage at a later date. After obtaining a license, the bride and groom are free to marry anywhere within the State of Maine. If one person resides in the State of Maine, and the other person outside the State, then a marriage license must be obtained in the town where the Maine resident lives if they intend to be married in the State of Maine. After obtaining a marriage license, the bride and groom are free to marry anywhere within the State of Maine. If both the bride and groom live outside the State of Maine, a marriage license can be obtained in any town in the State of Maine. After obtaining a license, the bride and groom are free to marry anywhere within the State of Maine. It is strongly suggested that the marriage license be obtained from the town where the marriage will take place so that it will be easy to remember where to apply for a marriage certificate at a later date. When the Town Clerk completes the marriage license, the bride and groom will be given the license along with a paper explaining to the person performing the ceremony how to fill out the ceremony section of the marriage license. The marriage license and informational sheet should be presented to the person performing the wedding ceremony (pastor, notary public, etc.). That person is responsible for filling out the ceremony section of the marriage license and obtaining two witness signatures. They are also responsible for returning the marriage license back to the issuing Town Clerk within 7 days of the wedding ceremony. The bride and groom are not permitted to submit the marriage license to the Town Clerk after the wedding ceremony. Find a Maine Notary near you. Once the wedding ceremony is complete and the Town Clerk receives the marriage license back at the Town Office, the Town Clerk records the marriage and the license/certificate of marriage will be filed at the Town Office forever. After the license is recorded, the bride and groom may obtain a Certificate of Marriage from the Town Clerk. The cost for a Certificate of Marriage is $15.00 for the first copy, and $6.00 for any additional copies of the same record purchased at the same time. The Certificate of Marriage is needed for a name change on a driver’s license, bank account, social security card, etc. Please note that the Town Clerk does not automatically mail the certificate of marriage. It is the bride and groom’s responsibility to appear before the Town Clerk to fill out an application and pay the fee to obtain the marriage certificate. All individuals requesting copies of these records must present positive identification and, if requesting the record of a parent or grandparent and you are not a registered genealogist, proof of direct lineage. Registered genealogists may only obtain a non-certified copy of a record, unless they can meet the above requirements for obtaining a certified copy. They may only view or obtain a copy of a birth, death, or marriage record. In order to obtain a marriage certificate through the mail, the applicant needs to fill out a vital records search application and enclose a copy of proper identification and proof of lineage, if applicable. 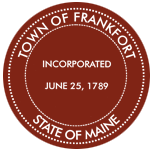 The application, along with the fee and a self-addressed, stamped envelope should be mailed to the Town Clerk at PO Box 218, Frankfort, ME 04438. The request will be processed the same day it is received. Website designed and managed by Saco Design.